Some highly scientific makeup testing has been going down chez moi – I’m pretty sure that Boots or L’Oreal or even NASA will be banging on my door, pretty soon, to try and copy my methodology. What I did (and I’ll put this in layman’s terms) is I dipped my finger in all of my favourite cream eyeshadows and then swiped it across the back of my hand. I then promptly forgot about the whole thing and went to the supermarket, the post office and the bank, never once looking down. Thank goodness I didn’t decide to try them all out across my face! I don’t really know what the outcome of this experiment was, other than that all of the cream shadows held really well (a special mention has to go to KIKO’s version, which had to be removed using wire wool and paint-stripper) and that I really liked all of the pretty colours. 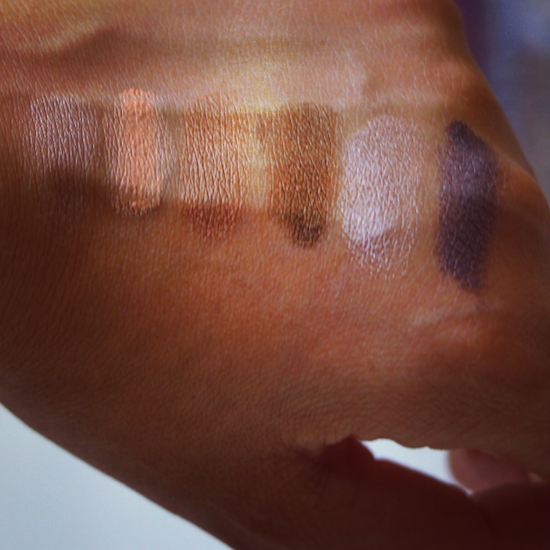 From the bootm of the photograph, clockwise, we have: Estee Lauder’s Shadow Paint in Chained , Chanel’s pinkish Illusion d’Ombre in Émerveillé, Tom Ford’s apricot-toned cream shadow in Escapade, Benefit’s Bronze Have More Fun, Smashbox’s 15 hour longwear in Quartz and KIKO’s Colour Shock in the dark violet shade 4. You can probably tell from the photo that the textures vary quite dramatically; the peachy Tom Ford shadow (top left) and the KIKO are very creamy and soft – like the texture of potted eye creams – and they give the most lustrous, rich sheen to the lids. The Chanel (left middle) is spongey and springy to the touch, the Benefit Bronze (middle) and Smashbox Quartz (top right) are both more solid and the Estee Lauder is soft and creamy but not as light and “whipped” as the Tom Ford. The standout shades for me are the peachy Tom Ford and the deep, rich bronze by Benefit, but I have to say that they’re all shadows I use on a regular basis. In terms of value for money, the KIKO shadow takes the crown, in terms of texture and longevity then it could be the Smashbox. They’re all brilliant, but I use the Smashbox in Quartz as an everyday eye base and the Benefit for a smokier look. The Chanel is perhaps the easiest to work with in a traditional shadow way, blending in easily with other shades and working almost exactly like a powder shadow once it’s on the skin. It can also be applied with fingertips – my preferred method for all of these shadows, actually – neatening up any clumsy mistakes afterwards with a Q-tip. 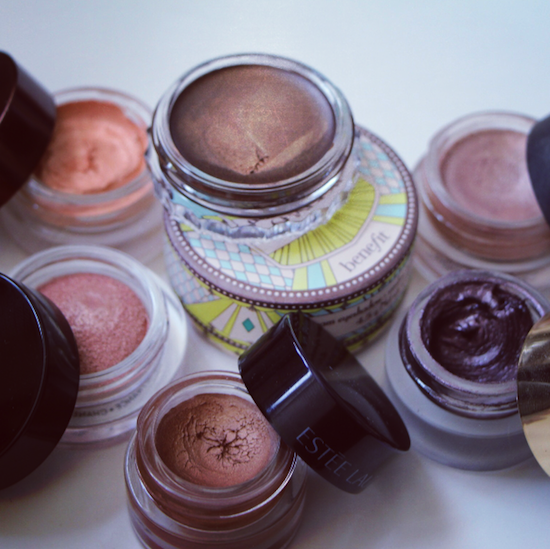 Do you have any favourite cream shadows? Add them to the list by leaving a comment below! You can see the Benefit shadow in a recent post here and if you need further info or stockists for any of the products, just click the links above!